Save $200 until April 25. - FREE SHIPPING in continental US! Delivery by May 15th. - International orders welcome - shipping charges added at check-out. 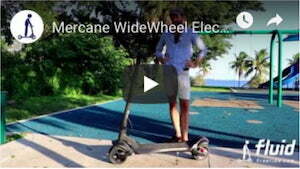 The Mercane Widewheel electric scooter has been designed for ultimate riding comfort. Ultra-wide tires with front and rear suspension ensure the most comfortable and smooth ride! This high-powered and foldable electric scooter with high-efficiency Lithium-ion battery guarantees strong acceleration, top speeds of 25 mph and 20+ miles on a single charge. Two powerful 500W motors make this the best electric scooter for hills. Experience a new feeling of freedom while cruising around on this stylish and powerful machine. Change the way you roll and upgrade your commute! Best I have ever used so smooth and comfortable great top speed. I settled on either the dual motor model because Bronx, NY has some pretty hilly streets in some sections. I also didn't want to worry about having to recharge too soon. This thing easily outperforms my previous Ninebot ES2 with external battery. I'm not sure about the range because I get so caught up in the fun of ridding I forget to check- so far I got as much as 2 hrs out of it. The pro's n con's are the same as already mentioned in other reviews. I decided on this scooter for the power & this retailer for the customer service. My experience with ninebot's c/s was so painful so it was a major factor in my buying decision. I began having issues a couple of days out of the box & Peter addressed them promptly which gave me a LOT of reassurance that I purchased from the right place. The interface did take me some time to get used to primarily in getting rid of the speed restriction. BTW you really should get a helmet when riding this thing -it's fun but no ain't no joke. At top speeds you can really get jacked up if you have an accident. Thank you Peter for all you help and I may be taking you guys up on the new display offer but do we need to ship the unit back to you guys or can it be realistically installed by us not too mechanically inclined folks? 1) There can be some jerkiness with the throttle which at times can be quite annoying. Although, I'm happy to see that this has been addressed in the 2019 version (and also will be available as an accessory). 2) And I can't really doc for this because I knew when I bought it, but the informational display is lacking. (just the 4 LEDs and would rather see more of a digital readout with speed, range, battery life, etc.) but again this is more just a want than anything else. In any case, the 2019 model (i.e. 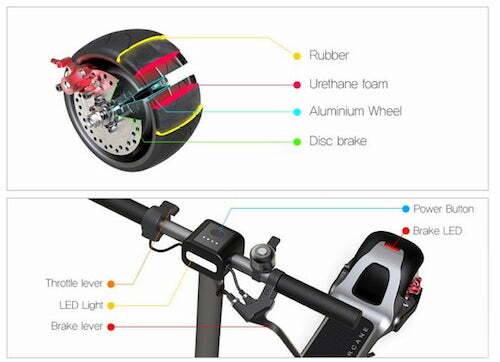 improved folding mechanism, upgraded material, etc. ) seems to address most any other con that I can think of. Customer support has been spot-on and quick to reply. Recommend wholeheartedly. THE EXPERIENCE...It’s impressive straight out of the box, It looks really cool, first time I rode it in Restricted Eco Mode, I headed straight for the biggest hill in Norwich it dealt with that with ease. Power Mode performance is surprising, Manoeuvring at low speed in power mode takes a couple of journeys to get use to. Around town stop start and on paths I use Eco Mode. FOLDING complaints about the folding mechanism are a matter of opinion. it’s simple and bullet Proof. (It’s not quick) This is the sort of scooter to race busses not take on one! DISPLAY. "there is no display" there’s a series of lights that are used to set up modes. CUSTOMER SERVICE... When buying an expensive items that may require spares and maintenance, customer service can be a deal breaker. Whilst researching "Peter and Fluid Free Ride’s" legendary customer service kept popping up in reviews, I had a long list of questions I needed answered before buying, Peter not only replied very promptly he itemised my questions and answered each one honestly and comprehensively. Hill Climbing Torque - the dual motor model will climb any hill and has been proven on the steep streets of San Francisco. Available in two variants: with a single 500W motor with 8.8Ah battery and dual (front and rear) 500W motors with a 13.2Ah battery. Cancel your order anytime for free prior to shipment. Just contact us. Staggered discounts and limited supply: the earlier you order, the better the price! *Officially the scooter is rated until 220 pounds rider weight - some customers report a good riding experience up to 260 pounds. While we do not recommend the WideWheel for riders above 220 pounds / 100 kg, we offer a neck support jacket to improve stability for heavier loads. Use at your own risk. The single motor model with the 8.8Ah battery has a realistic 15 mile range tested in real life conditions - other retailer claim up to 20 for the same model. The dual motor model with the 13.2Ah battery has a realistic 20 mile range tested in real life conditions - other retailer claim up to 31 for the same model. At fluidfreeride.com, we believe in honesty, customer service, and awesome products. We will accept a return against full refund if the scooter is not as described. 15 days no questions asked returns of unused products in case you change your mind. Buyer is responsible for return shipping. 90 days limited warranty for manufacturer's defects including battery - we will provide you with the parts or repair at our facility. We promise to always work with you to find a solution to any issue - even if not covered by our warranty. 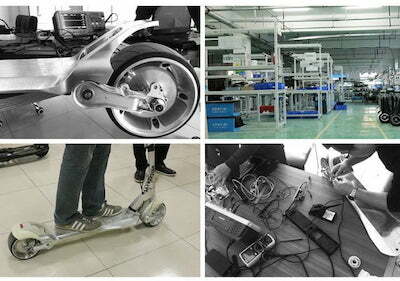 We have many parts in stock in the US to repair or maintain your scooter. Limitations apply, please see our full warranty and returns policy. It first appeared as an Indiegogo Campaign in January 2018. After surpassing its funding goals multiple times, the Korean engineering team delivered prototypes, developed a production process, and started mass producing at their factory in China. While the final pieces of the Indiegogo campaign are being delivered, Mercane has selected a few worldwide retailers to distribute its product. fluidfreeride is proud to be the exclusive distributor of the WideWheel in the united states. Watchout: the California based retailer mercaneglobal is neither affiliated with Mercane nor with us. Only scooters purchased through fluidfreeride will be covered by our warranty and benefit from our excellent customer service. Quickly running in somewhere and concerned someone will ride away? Just remove the key and your WideWheel will turn off. It cannot be turned on without the key. The upgraded throttle delivers much smoother acceleration without the jerkiness of the previous model. Ride at walking speed or go full speed. Live and accurate display of current battery voltage so you can better judge your WideWheel's charging status and overall battery health. The tightly fitting, zero rattle folding mechanism has been upgraded so that the screw stays in place no matter how much you turn. "I’ve ridden a ton of electric scooters, but I’ve never ridden anything quite like the Mercane WideWheel electric scooter from FluidFreeRide. With dual 500 W motors (that are almost certainly each putting out closer to 1000 W), dual front and rear suspension, crazy acceleration and high top speed, this scooter is just too much fun!" "There is a lot to like about WideWheel. It provides a speedy yet comfortable ride, with a range of up to 20 miles and top speeds of 25mph. Additionally, the scooter is pretty well-priced thanks to the pre-order discount and it comes with a 90-day warranty."